For the millions who watch the "Cafferty File" on CNN's The Situation Room, Jack Cafferty stands for common sense-the much-needed voice of reason who skewers right-wing nut jobs and liberal eggheads alike. For years, he's voiced the views, hopes, and fears of the average American in inimitable style. Now, in It's Getting Ugly Out There, he brings that level-headed wisdom to bear on the most critical issues facing us today-and explains why Americans must take our country back from those who are harming it. "It's been a target-rich seven years for someone like me who enjoys pushing people's buttons and sticking pins in things that need pricking, from rich and fatuous celebrities offering foreign policy analysis to the latest lying Beltway blowhard impaling himself on his sword of pomposity. . . . Anyone familiar with my daily 'Cafferty File' segments on CNN's The Situation Room knows I'm not exactly what you'd call the mainstream media's poster boy for feel-good news and commentary. In your face is more like it." "I'm no shrink, but I have the sense Bush has carried an angry chip on his shoulder much of his pampered life, seething just beneath the good-old-boy surface." "The bottom line is that our government no longer works for us. The government works for the lobbyists who have had a big hand in influencing (if not helping to draft) legislation favoring not the average American citizen but instead big business: health insurance, pharmaceutical and oil companies, and defense contractors, among others. These are the guys who can make the kinds of political contributions that are needed to finance today's multi-million-dollar political campaigns." "We want our troops home, but we also want a new army of elected officials to march into Washington and take a fresh, uncorrupted look at the needs of the vast majority of Americans. If these two parties, however 2008 breaks, can't fix what's broken, this way of life as we've known it may vanish into some deep, dark crevasse." His deep, fatherly voice may evoke the comfort of an old-fashioned, Conkrite-era news broadcast, but newsman Cafferty has made a career of saying whatever he damn well pleases: "I get paid to ask questions I don't know the answers to and to complain about the things that bother me." Reading the television news correspondent's first book feels much like watching his segments on CNN's The Situation Room, in which he follows a similarly straightforward formula: denounce bad leadership, media shortcomings and government missteps with a satirical tone just above withering. From Katrina to Iraq, from immigration to terrorism, from Bush-baiting to big business, Cafferty admits to "saying some pretty outrageous stuff" in order to get his audience riled up. Aside from skewering congress, shaming rich white guys, and repudiating Anna Nicole (the "peroxide blonde never-was"), Cafferty sheds some light on his own life, sharing personal episodes about disrespecting his boot camp drill sergeants and letting his terrier defecate in the lobby of the Des Moines television station for which he was working. Without his rich vocal presence, Cafferty's tough talking cynicism can become grating, but also cuts through, with ease, a media climate thick with rigid ideology and tabloid excess. "Very little of my backstory qualifies as Hallmark Card material, but it may help you to make sense of the way I see and interpret what's going on around me." views, hopes, and fears of the average American in inimitable style. Now, in It's Getting Ugly Out There, he brings that level-headed wisdom to bear on the most critical issues facing us today-and explains why Americans must take our country back from those who are harming it. In his daily "Cafferty File" segments on CNN's The Situation Room, Jack Cafferty focuses on the high, the mighty, and the often mindless public figures in politics and corporate America who think they can hoodwink the great American middle class indefinitely and get away with it. Millions of people watch him, feeling that he expresses their own concerns. Now, in his first book, Cafferty kicks his outrage into high gear with a brilliant condemnation of some of the most egregious and infuriating boondoggles, screw-ups, and swindles ever perpetrated on the American public. With both logic and heart, he assesses the ongoing damage done to our American democracy by the war in Iraq, the Patriot Act, illegal immigration, cowboy diplomacy, and the media that have often been all too willing to overlook or even encourage these nightmares. While his sights are set primarily on President George W. Bush and his team�Cheney, Rumsfeld, Rove, Rice, Brownie, and many more�Cafferty is an equal-opportunity curmudgeon. With the same intensity, he goes after the Democratic Party, Nancy Pelosi, the ACLU, and some causes beloved by liberals while sizing up the leading candidates for the 2008 presidential race. Cafferty argues that those in power are so isolated from the rest of the population and so indebted to the corporations, lobbyists, and tycoons who finance their campaigns and hire them when they leave office that they simply don't have a clue what life is like for most Americans and don't care enough to find out. Cafferty does care�and he shows it. It's Getting Ugly Out There shares many of the thoughtful, hilarious, perceptive, and moving e-mail messages from viewers of the "Cafferty File." These include some of the unprecedented thousands of e-mails received by CNN in the two days following Cafferty's resounding denunciation of the government's response to Hurricane Katrina�the ultimate example of indifference to the plight of citizens in desperate straits. Passionate, controversial, and in your face, It's Getting Ugly Out There is a rarity among current-affairs books�a searing, hard-hitting critique of the powers that be, not from the left or the right, but straight from the heart of a proud mainstream American. Jack Cafferty is a CNN host and commentator who appears regularly on the network's popular news program The Situation Room, where his "Cafferty File" segments are seen by two million viewers every afternoon. Six "Cafferty File" segments air each weekday. To those who feel the administration of George W. Bush and his cronies are doing a bang up job in leading this country in a positive manner this book is not for you. Jack Cafferty of CNN unleashes his opinions on what may be the worst administration in our country's history. The war in Iraq, illegal immigration, the mounting deficit, non-qualified cronies in cabinet positions, tax cuts for the rich, Hurricane Katrina, trampling of our Constitution, repairing our image abroad, Terri Schiavo, and scandals among the so-called "values party" are some of the subjects Jack Cafferty tackles in this 255 page stunner. The bottom line is that our country is going down the tubes, and unless Americans wake up the things our Founding Fathers stood for will be no more. Cafferty does say Bush's tragic administration may have one positive legacy. This arrogant and reckless administration may be the wake up call America needs to begin taking its country back from the lobbyists who expect payback for supporting a candidate in his campaign. Term limits, campaign finance reform, ethics reform, immigration reform, and significant lobbying reform along with an individual who can effectively lead this country in a positive manner are all things Cafferty lists as necessary to get our country back on the correct track. Whoever becomes our next president he or she will have a monumental mess to untangle from this most unfortunate Bush administration which will leave a negative impact on several generations to come. If your mind is closed like a steel trap in George Bush's favor this will not be a book for you. The truth will hurt too much. You have no doubt heard the expression, "Tell us what you really think." Jack Cafferty does just that right here every day in THE SITUATION ROOM. Jack has got a new book that's on sale today. The title is vintage Jack Cafferty. "It's Getting Ugly Out There, the Frauds, Bunglers, Liars and Losers who are Hurting America." And Jack Cafferty is joining us. You know, Jack, I went through the book. I read it over the weekend. I worked with you now for many years. And I know you. Our viewers know you. They may love you, they may hate you but there's lot of your life that they simply don't know. And when you told us the other day that this book was gut wrenching in putting it together, I now understand why. Let me read from the beginning of this book. One part of the book. "My folks were both alcoholics who between them were married 11 times. It would have been an even dozen, but my dad accidentally killed one of his fiancees." You go on to write, "I'm the product of a very dysfunctional, sometimes violent Irish background. Indeed, very little of my back story qualifies as Hallmark material but it may help you make sense of the way I see and interpret what's going on around me." Those are powerful words, Jack, and we spoke about this earlier. I want you to explain some of your background to our viewers that all of us were totally unfamiliar with. JACK CAFFERTY, CNN ANCHOR: Don't misunderstand. I didn't put that in the book because I'm looking for a sympathy card from anybody. But I put it in the book so that people who watch this program and listen to the things I say might have some sense of where this ongoing questioning of authority that I have comes from. And it's probably rooted in the fact that I learned pretty early on because of the environment I was in not to trust everything you see and hear because it's likely a good portion of it isn't going to turn out to be true. So that's sort of the reference point. I hope people understand that I'm not looking for someone to say poor Jack. On the contrary. I got some street smarts by the time I was a pretty young guy that a lot of kids never pick up because they're in more sheltered, quote, "normal" environments. BLITZER: It's amazing, Jack, that here you are, you are on CNN every single day and some of the early experiences that you openly write about in this book, it's amazing you turned out to be as great as you did. I've got to tell you, Jack, a lot of kids who went through what you went through with your mom and your dad would not necessarily have turned out to be like Jack Cafferty is today. CAFFERTY: Well, I wouldn't have turned out this way either except that I was started down the same road that my parents were on. I drank too much for too many years. And I was in the process of probably destroying a second marriage as well as the relationship that I value very much with my four daughters when 20 years ago I made a decision that it's going to be either -- you either got to change this and doing it in some way that makes some sense or you can look forward to the sort of tragic ending that your parents both met and they both died basically broke, alone and unhappy people. So 20 years ago I put down the cigarettes and the booze all in one year and that was the year I almost didn't survive but in looking back it was the right thing to do and smartest thing I ever did. And my life began to improve rather dramatically after that. BLITZER: It's amazing how you describe it because one thing that certainly comes through in this book and I think our viewers will love it is they can hear you say every one of these words on these written pages. They know your voice, Jack. It comes -- I can see you wrote this book from the heart. And I don't want to leave the impression that the whole book is just about Jack Cafferty. You have got some thoughts on the current administration, the political scene, what's happening in our world that you write about at great length as well. CAFFERTY: Well, I think there's a sense of betrayal on the part of at least a lot of the people that write to me on this program, Wolf, that they have been betrayed by a government that doesn't have their best interest at heart. An eighteen percent approval rating for our Congress. Somewhere between 35 and 40 percent approval rating for our president after as many years as he's been at the controls and a 70 percent rating of people in this country that feel we're headed in the wrong direction. And I get the sense that people are frustrated and disappointed and in some cases extremely angry that this country that they love and feel that they used to be a part of has simply bypassed them for the agendas of the large corporations and the special interests and the things that don't really matter to their lives. A lot of our jobs have been shipped overseas. We're celebrating the sixth anniversary of 9/11 and we haven't secured the Mexican border. BLITZER: What was the most difficult thing for you to write about in this book that you said was a gut-wrenching experience? CAFFERTY: Just going back and revisiting what a maladjusted young pup I used to be. Now I'm a maladjusted old pup. I don't mean to suggest that I've become anything else but some of the crap I used to pull on people, my employers, my family, when I was drinking and trying to hide it. I spent a lot of time with the shrinks because that's where you go to get help and I can remember leaving Channel 4 here in New York City and driving to a therapist appointment in New Jersey but I would stop it at the bodega across from Rockefeller Center to get a six pack. Put it in the car with me, drink three beers on the way to the doctor's appointment. Spell $150 discussing whether I had a drinking problem or not. And then drink the other three beers on the way home. And when I got home I'd have a couple more drinks before dinner. So it was a scam. And I'm not proud of that having to go back and deal with it again was a little tough. BLITZER: It's an amazing, amazing stories you tell in this book. And they all have the added advantage, Jack, of being true which is pretty good. Let me read a quote from the book. "It doesn't matter who they are or how long they've been there. Time to go. We want our government back." And then you write. "And if it doesn't work, hey, maybe you and I will run for office." What are you hinting at, Jack? Are we going to hear about Congressman Jack Cafferty or something? CAFFERTY: No. Absolutely nothing. The editor of the book called me one day and said this thing has weak ending. You have got to rewrite it. So I sat down and rewrote it. If we can't vote these crumbs out of office, we're never going to get term limits from the government we have because they would be denying themselves reelection and a job. So it ain't going to happen. We have to impose the term limits. The way we do that is at the voting booth. Incumbent, you're out of here. The idea of this government as envisioned by the founding fathers was sort of like jury duty. You come in for a couple years off the farm or out of the town and you go to the capital and serve the country and you do the nation's business with a pure heart and do the best for the people you represent and then you go back. You don't spend 40 years and build up these power bases and these pork projects and all of this garbage that our government has come to represent. So I was trying to suggest at the end, look, let's start voting them out. If that doesn't work, maybe you and I will take shot at it but I am just kidding. This is much more fun to sit here throw rocks at them than to actually be one of them. BLITZER: Well, the book is a fabulous read. I am beginning to understand, it's a scary Jack, I'm beginning to understand you a little bit. CAFFERTY: You will be in therapy next. BLITZER: I have to stay it's a good experience. 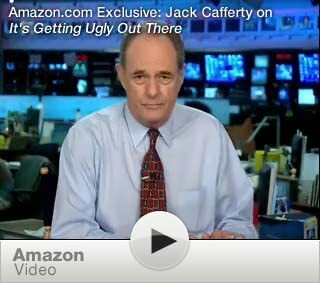 Jack Cafferty's new book "It's Getting Ugly Out There, the Frauds, Bunglers, Liars and Losers Who are Hurting America." The publisher is Wiley. I hope you sell a million copies, Jack, thanks very much for coming in. CAFFERTY: Well, thank you, Wolf. BLITZER: You're not leaving anyway because we have "The Cafferty File" in just a couple minutes. So we're going to make you work. CAFFERTY: OK. BLITZER: Thanks very much. Jack Cafferty has got a hot new book that I recommend highly to all of you out there.